Home » Paid » 100 Coins » Katekyo Hitman Reborn! http://www.line-stickers.com/ – Katekyo Hitman Reborn! 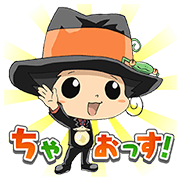 Line Sticker | “Katekyo Hitman Reborn!” is here with a LINE sticker set you can’t refuse! Meet Reborn the tutoring mafioso, Tsuna the unintentional boss, and other colorful members of the Vongola family! Name LINE Sticker: Katekyo Hitman Reborn! Publisher : DENTSU TEC INC.